NOT available for the Sideband Generator. Last edited by Aaron; 07-26-2016 at 07:02 PM. Please forgive my ignorance and very low I.Q. What would be done in using this combination and what are the many applications that this would be used upon? You have obviously made time consuming comparisons to match this up for precision results. Please elaborate leaving nothing out for myself and others with a minus 40, barely tying my shoelaces, I.Q. because Johns own devices usually have some proprietary design included. with an exersize: how to make an AM transmitter. type of mixing audio with carrier called sideband. The carrier wave has a center frequency and a width called bandwidth. The side bands are naturally above and below the center frequency. It is possible to use either the upper or lower side band. and others might be using that device. Thanks. No, I prefer not to go to that forum anymore. I have the knowledge and understanding of radio theory. I just thought Aaron had a use in mind for this combination to further our research in fine tuning our energy devices. Having background in radio is helpful. 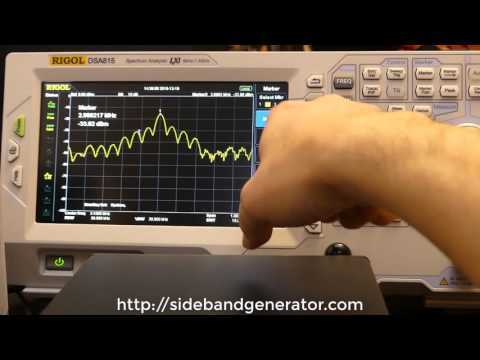 It is the simplest and most elegant solution for a 3.1 MHz fundamental frequency generator with all the harmonic sidebands. Aaron, in order for you to sell your expensive project, you must show the people what it is used for and guide them through it. I do not see anything I would want here except $400 worth of food that I am not eating. How does this unit make any difference? I used my WR-3 in a video to show everyone the noise a Bedini circuit produces. Show me what it can be used for in a video. It is speaking to those that already know what it is related to based on Bedini's presentation at the conference. For those that do not know, it will become well-known soon. Mikrovolt already posted a link that you should read to see what it is about. 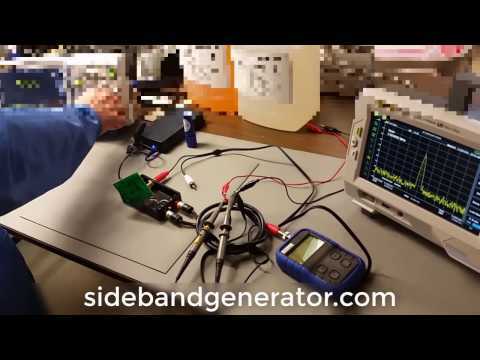 This is a BEDINI RPX SIDEBAND GENERATOR for experimental use only. No claims are given and the user assumes full responsibility for how they use it. This device is sold only as a research and test instrument. There are no other purposes or applications for this device that are claimed or implied in any manner whatsoever. By purchasing this device, you are agreeing to a no-refund policy. Gee, I suppose it does nothing at all. I looked at the link. Does the American Medical Association know of this medical device? No video and I did not go to the conference. Maybe selling it as a useful electronics tool would sell itself. I am criticizing because I want you to be successful. I cannot endorse a medical device. It is sold as an experimental tool only. The frequencies of the sidebands that get hit are the strongest right next to the fundamental. In other words, all the real Rife frequencies get hit the strongest compared to using other fundamentals. So why did Rife use 3.1 MHz? Rife frequencies as I understand them are frequencies the Beam Ray is modulated with to get as close to the resonant frequency of harmful microbes. The "Mortal Oscillatory Rate" is amplitude-modulated into a carrier that is significantly higher in frequency than the modulating frequency itself, probably harmonics there of. To the best of my understanding, the frequencies of different microbes would all be arbitrary, unless there's some sort of pattern I'm unaware of. If Rife has a list of frequencies that he used to treat different ailments, odds are they were all harmonics of the carrier frequency, which brings me back to my first question; why did Rife use 3.1 MHz? Is that one particular frequency supposed to be important, or was it just what was available to him at the time? If we ignored Rife's frequency list entirely & built a system with no modulation, only a variable carrier, wouldn't it be more effective? Honestly, I don't know very much at all about radio equipment, I'm just going by what I understand of what Rife said. I'm just saying, wouldn't it be just as effective if not better to simply use a signal generator or even computer audio output connected to an amplifier, wired to a step-up transformer, to one of those phanotron tubes, dual coil induction tubes or an antenna? If that works as I think it would, what's the purpose of the sideband frequencies? Listen to the video I posted with John's explanation - you are being told exactly what the methodology is and why. I re-watched the video & I still don't really understand. There's only 2 things he's said that really oppose what I suggested. "Without sidebands, you don't have a real Rife machine." The modulation frequencies need to be higher than audio frequencies. For simplicity's sake let's just assume I'm using that Velleman HPG1 1Mhz Pocket Function Generator instead of an average PC, which is usually only capable of up to around 22khz. With that out of the way, he still hadn't explained why the sidebands are needed, nor my previous question as to why 3.1 MHz carrier is needed. If you have a Rife microscope and find one particular thing and one particular frequency that can be used for one particular thing, do you think that frequency will always be the same? The answer is no because things change and evolve and it can change a bit so the original frequencies are not etched in stone. There is a certain margin of error that can be done and Rife even indicated that the frequency can be a certain ways off and with the sidebands, you hit them all without knowing the exact frequency. The microscope is no longer needed since it showed the basic frequency ranges for different things. With 3.1mhz as the fundamental, I did state that you get the strongest sidebands. With the other frequencies, 3.2, 3.3, etc... the sidebands that hit all the frequencies are down the scale a few spikes away from the fundamental, but with 3.1, they're exactly right next to the fundamental meaning those sidebands have the strongest power. It is as simple as that. I believe it may be double sideband since the fundamental frequency is also there at the same time. If the fundamental is considered the carrier, then it is double sideband. 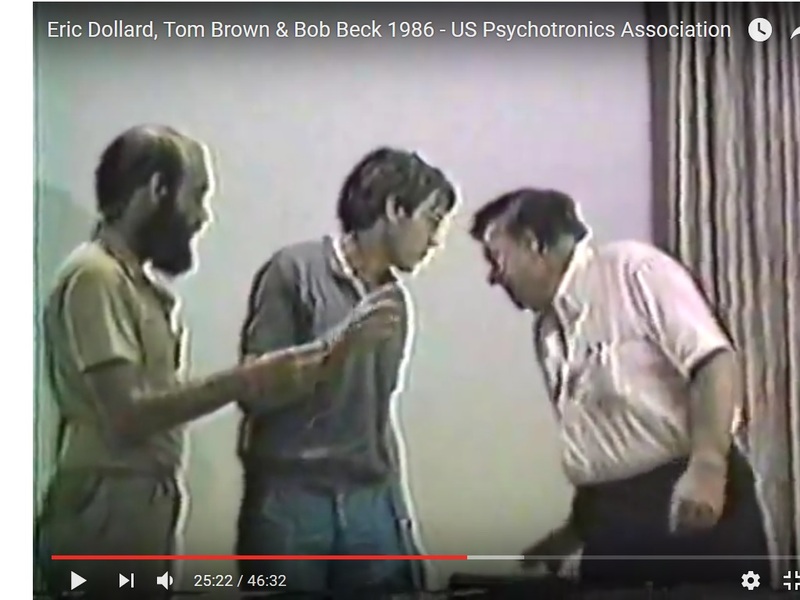 Look at post #11 where I showed John's video - you can see it on the spectrum analyzer. We will even program it for you! All you have to do is hook it up and turn it on - simple! This is only available in the combo package. 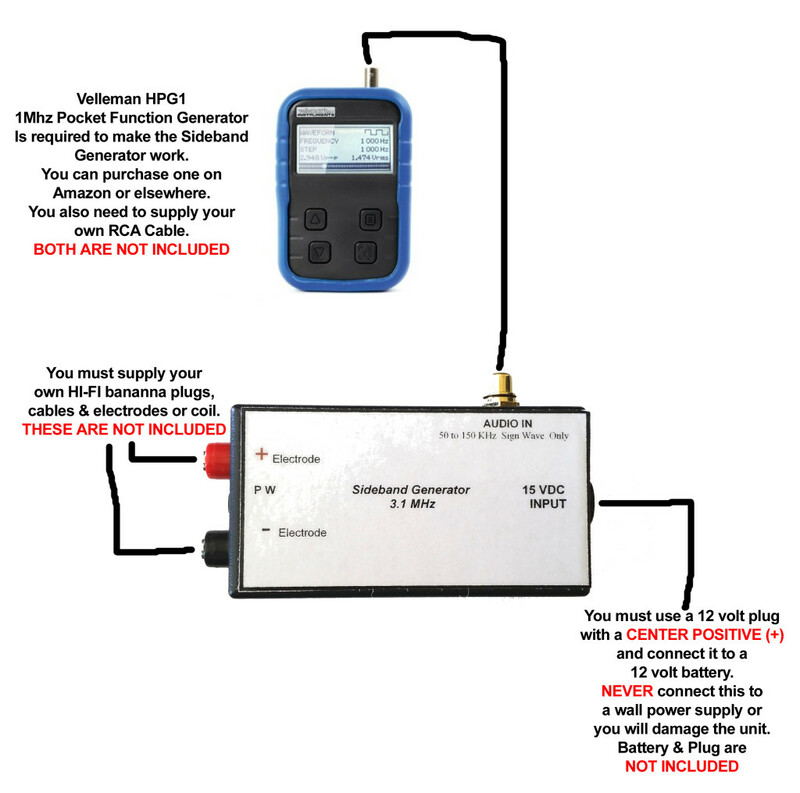 The Velleman HPG1 is a small portable signal generator that we use with Bedini's RPX Sideband Generator. The audio signals bounce off of a high frequency fundamental and causes other frequencies to ripple off that hit all the REAL Rife Frequencies. The HPG1 is affordable and works well but Velleman is discontinuing it. Therefore, we purchase the company's entire remaining inventory and there are only 20 something units left! Hi, I completely understand that A & P Electronic Media does not want to make any claims whatsoever for this technology. And that it is intended for experimental use only. But (just like with Amazon product reviews) I'd like to see some comments from users about how satisfied they are with their units. And what kind of experiments they have been conducting. I realize that no claims should be made by Aaron or the owners of the units. (Such as RPX will do this or fix that.) But at least the owners could say what kind of practical uses they have found for their RPX. With the readers understanding that their mileage will surely vary. PS I am familiar with Rife technology, but have never owned any devices. Last edited by wjcroft; 05-11-2017 at 01:37 AM. You can see what some are saying or asking here: Bedini RPX Sideband Generators more active than this forum on this topic. We sold out of our second production run of 150 RPX units and just received our third production run of another 150 units. This is the most sought after Rife machine on the planet hands down! The signal generator we were using was the Velleman HPG1 and we actually had to buy out the entire company's remaining inventory and we're just about out of them. Velleman has a replacement HPG1MK2, but the cost is higher and they don't even come with a rechargable battery pack built in. It looks like a great little unit, but we're not that interested in paying more for less and we don't want to charge more for less. Therefore, for the time being, we're keeping the RPX COMBO price the SAME while providing a function generator that is way more robust than the HPG1. We have a small number of these units being shipped to us right now and these will be included with the next COMBO units that get shipped out. It may be 1-2 weeks before your COMBO can be shipped, but it will be well worth the wait. If you're just ordering the RPX unit by itself, it can ship ASAP. 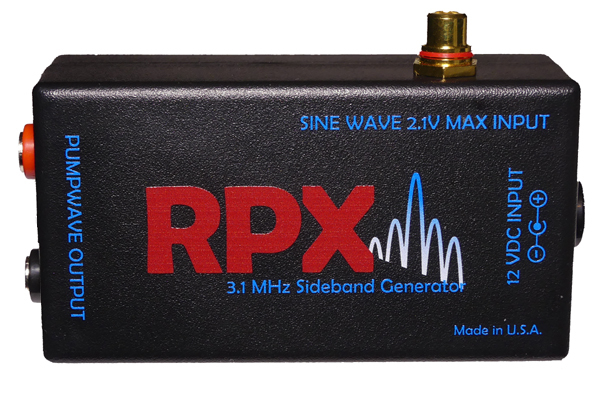 If we have enough interest in the new signal generator unit for those who already purchased an RPX or RPX COMBO in the past, we will consider making the signal generator available as a stand alone item. Otherwise, we will only offer it in the COMBO. Wow that is a deal, let me think about it. That is low priced. some left by the time I get back. Thx Aaron for answering my questions. Bedini RPX - What are the sidebands generated? Last edited by BroMikey; 06-09-2017 at 08:51 PM. Now I am catching on. Last edited by BroMikey; 06-09-2017 at 09:18 PM. While i do agree with the RPX system and it does seam to do it's intended job of what Rife did as i have been researching it for quite some time now i have to say without an MOPA RF amplifier this system is totally useless. it is completely impossible at these extremely low voltages to get any results what so ever. Rife's original system output just the main MOR freguency that was so intense it could be detected for 8 miles. since the FCC shut him down he had to come up with a better idea. advanced to #5 he used a carrier wave and modulated it with an audio signal. why, because the audio frequencies with out an RF carrier will not enter the body past the skin. he sure didn't use .5 watts of energy he used 50 to 100 watts of energy. so again i have to say the RPX system without an MOPA RF amp is useless in it's self but matting it with an MOPA RF amp will get you to the point where you want to be. Last edited by marathonman; 07-25-2017 at 09:53 PM. I haven't been here in a very long time! I've been researching this behind the scenes for a very long time. You're not understanding what the RPX is. There is a very low frequency square wave around 8 cps that the 3.1mhz and sidebands are carried on and that square wave is what delivers it. That isn't theoretical - that is exactly how it works and is why it can work at such low power. Bedini is a GENIUS. Watch his books and videos on the subject at least and then you'll understand it. That causes the "pump wave."